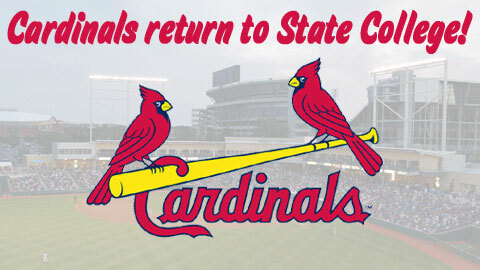 STATE COLLEGE, Pa. -- The State College Spikes today announced a new two-year Player Development Contract (PDC) with the defending World Series champion St. Louis Cardinals that will extend through at least the 2014 New York-Penn League season. The joint announcement was made by Spikes chairman and managing partner, Chuck Greenberg, and Cardinals farm director, John Vuch. The Spikes and Cardinals will formally introduce the affiliation as part of a media, season ticket holder and sponsor event on Wed Sept. 19 at 12:30 p.m. at Medlar Field at Lubrano Park. The announcement of the affiliation agreement between the Spikes and Cardinals marks a rebirth of the partnership between the two clubs. St. Louis served as State College's Major League Baseball affiliate during the team's inaugural 2006 season, and produced a club that featured nine future Major League players, as well as the lone winning season in Spikes franchise history to date. Two of those nine players -- pitcher Jason Motte and outfielder Allen Craig -- pitched and caught, respectively, the final out of the Cardinals' World Series-clinching victory over the Texas Rangers last October. "The State College Spikes are very pleased to rekindle our partnership with one of the most well-respected and successful franchises in all of professional sports," said Greenberg. "The Cardinals were wonderful partners during our inaugural season, and their players, coaches and other player development staff were instrumental in helping to legitimize both the Spikes brand and Minor League Baseball in the Centre region and all of Central Pennsylvania. The manner in which the Cardinals operate, both on and off the field, is respected and emulated by the entire baseball industry. We are excited to bring the 'Cardinal Way' to our loyal Spikes fans." "The 2006 season as a Cardinals affiliate remains the highlight of the Spikes' seven-year history, and we are proud to realign with their successful, consistent approach to player development," said Spikes' general manager, Jason Dambach. "Off the field, the Cardinals support of our community outreach efforts and our philosophy on providing fans with a fun, affordable, memory-making experience at the ballpark 38 nights each summer makes this partnership the perfect match." The Cardinals' most recent New York-Penn League affiliate, the Batavia Muckdogs, enjoyed a successful past six seasons (2007-12), posting a combined record of 240-210 (.533) with two postseason appearances and a league title in 2008. During that same period, the Spikes won 51 fewer games (191-260, .424) with no playoff appearances or winning campaigns. This past season, Batavia posted a winning record of 44-32, the best mark of any NYPL team not advancing to the playoffs. Three St. Louis affiliates reached postseason play in 2012, including Rookie-level affiliates, the Johnson City Cardinals (Appalachian League) and the Gulf Coast League Cardinals, whose rosters featured many players expected to join the Spikes for the 2013 season. The Double-A Springfield (Mo.) Cardinals, managed by 2006 Spikes hitting coach Mike Shildt, won the Texas League championship. At the Major League level, the 2011 World Champions are currently contending for a Wild Card spot in the National League postseason. Overall, the Cardinals have won a National League-record 11 World titles and their 18 appearances in the Fall Classic are tied with the Dodgers and Giants for the most in NL history. "As part of our player development model, we are always striving to improve the overall training and development environment for our players, and Medlar Field and the State College ballclub offer us a first-class experience at all levels," said Cardinals' senior vice president/general manager, John Mozeliak. "We look forward to our renewed relationship with the State College Spikes." "We are pleased to have reached agreement with the State College team and renew our relationship with an organization that we shared affiliation with in 2006," stated Vuch. "The Spikes have a terrific facility at Medlar Field and I know their management team is just as excited as we are to be partnered once again." The Spikes are one of seven affiliates in the Cardinals' player development system, joining the Memphis Redbirds (Triple-A/Pacific Coast League), Springfield Cardinals (Double-A/Texas League), Palm Beach Cardinals (Class A Advanced/Florida State League), Johnson City Cardinals (Rookie Advanced/Appalachian League) and Gulf Coast League Cardinals (Rookie). St. Louis also has an affiliate at the "low" Class A level that will be announced soon. Additional information and news about the Spikes' affiliation with the St. Louis Cardinals is available at www.statecollegespikes.com online. 2013 Spikes season tickets are currently on sale, and can be reserved by calling (814) 272-1711 or toll-free at (877) 99-SPIKES (877-997-7453). The team's 38-game New York-Penn League schedule is expected to be released in October.